The chain's name references both the English figure of the beefeater, as well as its menu's meat (particularly beef) offering. The chain is positioned slightly upmarket of Whitbread's Brewers Fayre chain. Beefeater was set up by the then Whitbread Brewery in 1974 with the opening of its first restaurant, The Halfway House, in Enfield. The premise was for simple food, such as prawn cocktails and char-grilled steaks, and was seen as a rival to Berni Inns. Beefeater expanded over the next 20 years, before the chain experienced difficulties in the 1990s. During the 1990s the flagging brand tried a number of strategies to boost sales. A large number of Beefeaters, for example the Ock Mill in Abingdon, and the Crossbush in Arundel, were converted to "Out and Out". This was unsuccessful and they were rebranded back to Beefeater in 2005. Also a few sites became "Grillbars", but these were soon sold. A "Banter" was launched at the Roundabout Beefeater in Reading, which has since been demolished after it failed. Brian Turner was recruited to advise on the remaining Beefeaters, and his signature dishes and face were featured on the menu. As the brand declined further, a number of sites, such as "The Cotton Mill" in Kilmarnock and "Craig House" near Inveresk, were rebranded as Brewers Fayre, while others were sold, like the Carpenters Arms in Botley, Oxford, now a McDonald's. In the early 2000s, the parent company Whitbread invested millions of pounds refurbishing almost all of its Beefeater outlets in a project known internally as "B2". This involved the complete refurbishment of the restaurants from scratch, retaining nothing of the existing fittings and design. The refurbished restaurants, described by the parent company as "warm, modern and stylish", have been mostly successful and embraced by customers. Main changes included chargrills in all outlets, and many have open plan grill areas so customers can see their meals being prepared. However, in 2006 Whitbread sold the majority of its standalone Beefeater sites (along with standalone Brewers Fayre restaurants), to Mitchells & Butlers. These were rebranded under Mitchell's & Butlers' own brands. 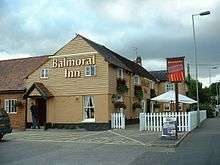 Whitbread's refurbishment programme was completed in 2008; the last site was the Woolpack outside Ashford in Kent. 2008 saw the Pemberton Beefeater built in Llanelli which was the first new site to open since before 2000. Since then new sites have been built alongside new Premier Inn hotels in locations such as Burges Hil and Stirling. 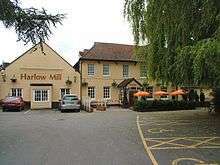 Also in 2008 Beefeater acquired 10 Brewers Fayre sites such as "The Millfield" in York. In 2009/2010 Beefeater implemented a remodelling and retraining programme similar to the Brewers Fayre programme. All sites received a partial refurbishment, which featured a new colour scheme, carpets and furniture. In late 2009, the brand became known as Beefeater Grill. In September 2013, Beefeater began a partnership with the Gourmet Society, offering their members discounts on production of a Gourmet Society restaurant discount card. In 2013 a new look and feel was introduced, returning the name to Beefeater. The company introduced a new logo featuring a stylised cow in 2015. Beefeater restaurants are located thhroughout mainland Britain from Inverness "Loch Ness House" to Plymouth "Marsh Mills". Most restaurants are located alongside major road junctions with a neighboring Premier Inn however a few are found in town centres. ↑ "About us". Beefeater Grill. 2012. Retrieved 19 October 2012. ↑ "Beefeater sites bought by M&B". BBC News. 21 July 2006. Retrieved 24 March 2016. ↑ Bains, Sanjeeta (27 February 2016). "See inside new Bar and Block steak restaurant and bar in Birmingham". Birmingham Mail. Retrieved 24 March 2016. ↑ "Vernon Kay talks food, family and turning 40". Retrieved 3 December 2016.